On Sunday, I drove to the Santa Ana train station and parked in the parking structure. After phone calls to Metrolink on Friday and Saturday about the fact there are no Sunday Orange County Line trains listed in the ticketing machines, I was hoping this would be fixed this morning. They had the Inland Empire-Orange County weekend service that was added the day before, but would not happen for two more weeks. 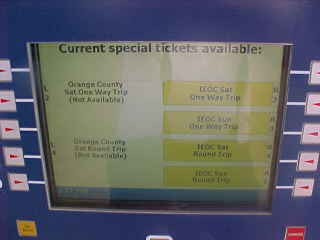 But at the Santa Ana Metrolink ticketing machines, there was still no Sunday Orange County Line service on the special train page. I met Chris Parker who needed to buy his Amtrak tickets for the day. We sat out on a bench and I colored a map with our driving routes for our pre-NRHS trip in less than two weeks. 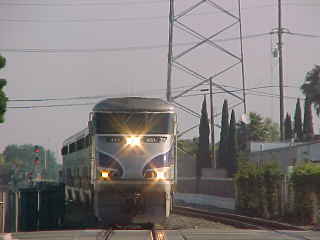 Surfliner 763 arrived while I continued to work. 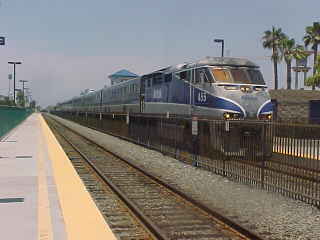 Surfliner 564 arrived at Santa Ana on time to take us to San Juan Capistrano. We found Ken Ruben aboard and took seats in Car 4. It was a quick trip to San Juan and we detrained. At the Metrolink ticketing machine, there we found the same thing. Ken then called Mike McKinley of Metrolink who suggested we buy senior tickets which would be about the same cost of Sunday - 50% off - and then tell the conductor of the problem. 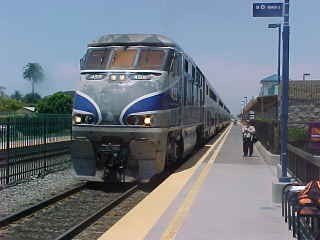 Chris and I were busily working and talking about our trip as our Metrolink train arrived at San Juan Capistrano. Once on board I found the conductor and told him about the ticketing problem. Upstairs in the cab car, I was surprised to find Steve Grande of Trainweb.com and Trainparty.com fame who took Amtrak south last night to Oceanside then got on 655 there. We all had a nice conversation as the train rolled north towards Los Angeles. An LA County Sheriff Officer came by to check tickets and was in a very good mood. Steve detrained at Fullerton and we arrived at Los Angeles Union Station early. I detrained as it was time for some pictures. 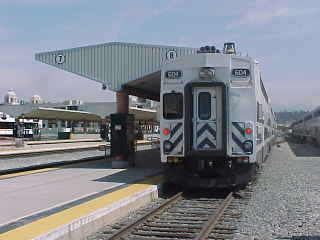 Metrolink 655 after it had arrived into Los Angeles Union Station. 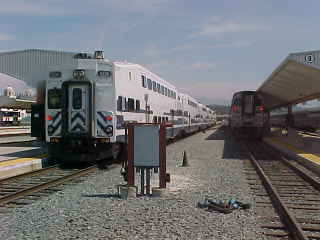 Metrolink 655 and future Surfliner 578 at LAUPT. 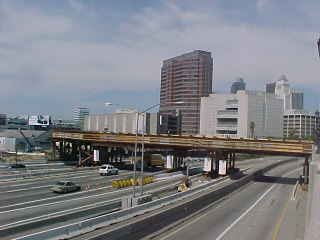 From the end of the platforms, the Gold Line extension construction could be seen as work on the bridge across the 101 Freeway continued. We boarded the Coach/Cafe Car and took a table upstairs. Bob Riskie took our tickets and I settled in for the ride to Oceanside reading the new Trains Magazine. Chris and Ken spent most of the trip down in the cafe so I had a peaceful ride. 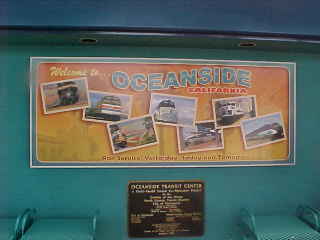 We arrived at Oceanside early where I saw the Welcome to Oceanside Sign that shows the history of trains in this coastal city. 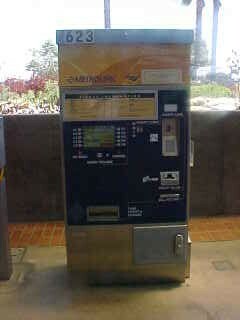 We went to a ticket machine to get our tickets to head home. We saw the same screen as this morning showing no Sunday Orange County Line Service, even though the first runs were today. 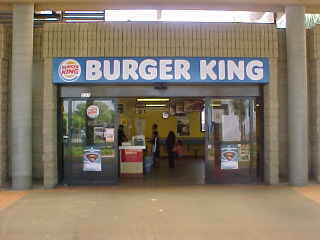 Ken, Chris and I had lunch at the Burger King at the Oceanside Transportation Center and afterwards, we watched an on-time Surfliner 577 do its station work. 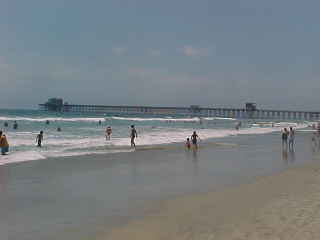 Chris and I walked two blocks and down the stairs to the beach. As we returned to the station our train home pulled up on the platform. We boarded the rear car and had a relaxing trip home on the first run of Train 657 on Sundays. At CP Capistrano we waited a minute for Metrolink 656. At San Juan Capistrano, Dan Dalke joined us as he had come south on 656. All too quick, we were returned to Santa Ana where Chris and I said goodbye to Ken and Dan. 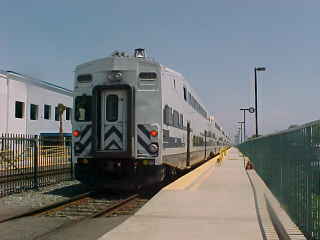 This ended another good day of train riding on the first runs of Sunday Metrolink Orange County Line service.